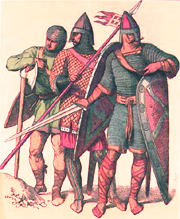 (descended from an Anglo-Saxon family that first settled in England around Stamford on the River Welland and Stanford on the River Avon in as early as the late 5th Century; said to have fought bravely at the Battle of Stamford Bridge 1066, but then, 3 weeks later, was disgraced at the Battle of Hastings, for pursuing the Normans and not staying with the dying King Harold as honour dictated. When William confiscated all his land, and he was was forced to surrender his sword, he broke it in disgust - thus the broken sword in the family coat of arms. ?John Staunford of Wheathill nr Stanford-on-Teme, Salop b c1320? Thomas Stanford b Rowley Hall c1480 d.1532. (Cornet 1st Royal Dragoon Guards 1790, Lieut 1792; inherited Hutton Estate 1790. 1794 m Mary dau of Thomas Staunton of Calva, Ireland.